New urban park in downtown Nashville, on the banks of the Cumberland River. Trails wind around this compact urban park. A brand new urban park on the Nashville scene in 2015, Cumberland Park sits right downtown between the river and the city's iconic Broadway strip. The park is compact but packs a lot of action into a small space - you can walk the winding web of sidewalks through the park, and kids can climb on living walls. To place the park in context, its educational displays give fascinating information about the purification of the Cumberland River's water. As a city resident, this is something I don't think about every day, and Cumberland Park provides a wealth of information right in a riverside location. The setting is a huge part of why Cumberland Park is great. 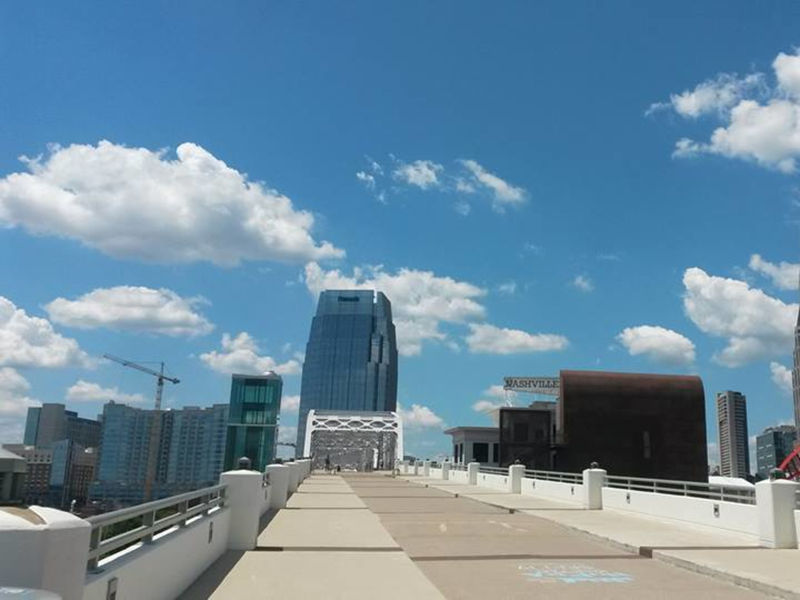 The river and its several arching bridges provide an impressive backdrop to the east, while the western side of the park is flanked by Nashville's busy and music-filled downtown streets. The iconic skyscrapers and "Batman tower" rise above the honky-tonks of Lower Broadway. The park itself covers 6.5 acres, but the views are panoramic and impressive. Cumberland Park has been designed with children and families in mind, and the play structures throughout the park are exciting for kids. The amphitheater at the southern end of the park has a capacity of 1,200 people, and seeing a show here is an impressive and quintessentially Nashvillian experience. The gravel Explorer Trail weaves through a habitat that has been specifically designed to attract butterflies, so hikers can see some beautiful wildlife in the heart of the city. The Gorge' is a stone climbing-wall suitable for kids, with fun features such as poles to slide down and ropes to climb. 'The Hollow' is a play area with an undulating washboard-style grassy surface, kids can get a workout clambering on this unusual structure. This area also features a cloud bridge that has "rain curtains" and a splash pad that is interactive. 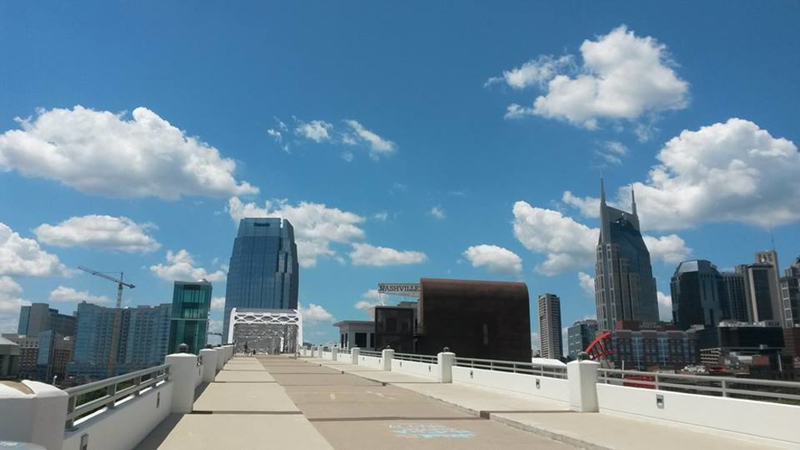 These ingenious features are unlike anything else in Nashville's city parks. Water is also used to create mist features over 'The Scoops', a path of stepping-stones where people can cool off on hot summer days. Cumberland Park is built with families in mind, and kids will love the play areas and structures. 'Because of its central location, Cumberland Park is a great choice for visitors to the city who do not want to drive out of town to find a park. The park is walkable from either side of the river, via the pedestrian bridge. There's parking for bikes, and you don't need to deal with parking as public transport links converge on the riverside park. The Music City Star has its downtown rail station right next to Cumberland Park, and many Nashville MTA bus routes drop off in front of this station. Cumberland Park is a great option for those with mobility challengers, or wheelchair users. The parking lot for Cumberland Park is shared with the L.P. Field on the other side of the river. There are plentiful portaloos surrounding this parking lot. The park opens at dawn and closes at 11 p.m. The park sits between the pedestrian bridge on Shelby Street and the Korean War Veterans Memorial Bridge. From the pedestrian bridge there are newly-installed elevators and stairs that lead visitors down to Cumberland Park.